Available for the Kindle & iPad, or in a Paperback edition. The Kindle edition of History of Bread in Iran is an exact reprint of the printed book and can be viewed using Kindle Fire as well as on the iPad using the Kindle app for iPad. The iTunes iBook edition of History of Bread in Iran is a fixed format digital edition of the printed book, which matches the pages number but the type is digital, which means the hyperlinks are live. Given the importance of bread in the Iranian diet, it is surprising that its role in Iranian society has so far been ignored as a subject of study. Since ancient times, bread has been the staple diet of the peoples living in the Iranian plateau. 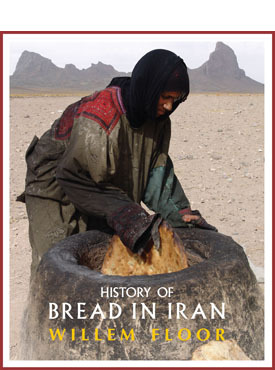 In History of Bread in Iran, Willem Floor, one of the foremost scholars of Iranian history, describes the beginnings of agriculture and bread-making, and the various grains and other products that were, and are, used to make bread. He then delves into the making of dough in rural and urban areas, followed by an overview of baking techniques, and the many kinds of bread that were—and continue to be—made in Iran. And, because Man does not live by bread alone, we are offered an overview of the spiritual and social aspects of bread in Iranian society. Finally, the author assesses the dietary importance of bread to the people of Iran and ends by addressing the question of how the State dealt with “the bread issue,” which often determined the rise and fall of governments. Willem Floor studied development economics and non-western sociology, as well as Persian, Arabic and Islamology from 1963-67 at the University of Utrecht (the Netherlands). He received his doctoral degree from the University of Leiden in 1971. Since 1983, Dr. Floor was employed by the World Bank as an energy specialist, however, after his retirement in 2002, he has dedicated his time to the study of the social and political history of Iran, and has published extensively throughout this time. His books include: Public Health in Qajar Iran, Agriculture in Qajar Iran, and The History of Theater in Iran, as well as, The Persian Gulf: A Political and Economic History of 5 Port Cities, 1500-1730, its second volume, Persian Gulf: The Rise of the Gulf Arabs, 1747-1792, third volume, The Rise and Fall of Bandar-e Lengeh, the fourth volume, Bandar Abbas: The Natural Gateway of Southeast Iran, and the fifth volume, The Persian Gulf: Links with the Hinterland Bushehr, Borazjan, Kazerun, Banu Ka’b, & Bandar Abbas. He has also published, Travels Through Northern Persia, 1770-1774, Titles and Emoluments in Safavid Iran, and A Social History of Sexual Relations in Iran; Labor and Industry in Iran, 1850-1941; Guilds, Merchants and Ulama in 19th Century Iran; The Rise and Fall of Nader Shah; Games Persians Play. His translations include: Samuel Gottlieb Gmelin’s Travels Through Northern Persia 1770–1774 , and with Hasan Javadi, Abbas Qoli Aqa Bakikhanov’s The Heavenly Rose-Garden: A History of Shirvan & Daghestan; Evliya Chelebi’s Travels in Iran and the Caucasus, 1647 and 1654; A Man of Two Worlds: Pedros Bedik in Iran, 1670–1675, The Persian Gulf: The Hula Arabs of The Shibkuh Coast of Iran, The Persian Gulf: Dutch-Omani Relations A Commercial & Political History 1651-1806, and The Persian Gulf: Muscat – City, Society and Trade .